Paris School kids receive…and achieve: At Paris School, we provide our students with the tools they need to succeed! From school-wide student technology to Project Lead The Way programming, we are proud of our commitment to helping kids learn and explore beyond the norm. Dynamic and interactive technology in every Paris School classroom adds measurable dimension to our curriculum by facilitating active learning and maximizing student engagement. Our ongoing classroom technology initiative ensures that our students have the best technology at their fingertips and our educators a virtual world of resources to augment classroom experiences. Comprehensive Project Lead The Way (PLTW) curriculum is at the heart of our Science, Technology, Engineering, and Math (STEM) programming. This nation-leading, transformative learning approach empowers students with applied learning experiences that teach real-world skills of problem-solving, communication, critical and creative thinking, collaboration, and perseverance. 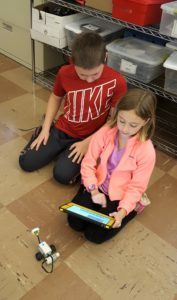 As a Project Lead The Way Distinguished School, our educators are trained to deliver the best STEM experiences through PLTW LAUNCH for 3-5 graders and PLTW GATEWAY for middle school study. PLTW GATEWAY programming prepares students for secondary study and continuation of STEM learning at higher levels.